For me, that’s the last line of the film. If I kept watching, I’d see Kevin Costner standing over Kennedy’s grave while (I kid you not) a black family kneels reverently in the background, and then I’d spend the next twenty minutes cleaning the vomit off my couch and carpet. But up until Mr. X, holy cow, JFK can be a really fun and exciting movie, if you get yourself in the right spirit. Everyone agrees that the “conspiracy montages” are what make the film so great. Here’s how they work: a character delivers a five, ten, sometimes fifteen minute explanation of some theory of the assassination, occasionally interrupted by skeptical questions from other characters who are immediately satisfied with the answers, while Stone, in a rapid montage, cuts between the lecture (which would be unwatchable on its own) and shots of events, sometimes multiple versions of the same event, and unrelated images – some of which are a little creepy (there’s a recurring skeleton). The tone and content of these conspiracy montages get creepier and creepier as Garrison and his aids acquire more knowledge, closing the gap between themselves and the truth. Stone goes out of his way to make the Cubans and right-wing militants look ghoulish. (Many of the villains are gay, and Stone’s portrayal of homosexuality is absurdly problematic.) But these men are only demi-goblins amid a much larger Walpurgis of horrors, the center of which is not a fringe Cuban operation but the all-powerful military-industrial complex. This is when Mr. X intervenes. He arranges a secret meeting with Garrison in the most public and out-in-the-open part of Washington D.C., where he tells Garrison, “You’re on the right track.” X reveals himself as a former military intelligence officer (under the supervision of a man he calls “General Y”) who helped oversee “black-ops” in the 1940s and ’50s: helping Nazis escape Europe, orchestrating the overthrow of Mossadegh in Iran, rescuing the Dali Lama from Red China, that kind of thing. Once they got involved in Cuba, says X, things started to go wrong. Why was Kennedy killed? Stone uses X to reveal his (Stone’s) ultimate thesis: John F. Kennedy planned a complete withdrawal of U.S. troops from Vietnam by 1965. This was a step too far for the military-industrial complex. The only way to stop Kennedy from pulling out the troops was to kill him. Lyndon Johnson agreed and signed on. Well, Stone doesn’t state that directly; he lets the montage do the talking. Despite the absurdities of this scenario, it’s a blast to watch. But the closer you get to the center of the conspiracy, the vaguer it becomes. The weirdos on the fringe are characters with dialogue. They’re played by Joe Pesci and Tommy Lee Jones, real people. They’re tangible. But once you move beyond them, well…you don’t really move beyond them. JFK was one of my first exposures to the lacuna-thriller: films that don’t quite satisfy you, films with characters who are defined and driven by their need to know what is probably unknowable. Movies like All the President’s Men, Jacob’s Ladder, The Vanishing, The Conversation, Don’t Look Now, Zodiac, Upstream Color, and even Zero Dark Thirty. Not all these films involve conspiracies and a few result in an actual solution to the mystery. But they all strike a similar register. I saw The Vanishing when I was 17. The whole film terrified me, not just the ending but also the beginning, the innocuous bits, the picnic at the petrol station. A man’s life is disrupted by a single, inexplicable event. He is overwhelmed by the need to understand the event, to make an inexplicable few minutes explicable. But if he succeeds, his whole identity – which has gradually been absorbed by his obsession with knowing – would disintegrate. He lives to know what happened, but his life is sustained by his ignorance. The Vanishing handles this tension brilliantly. Detective John Munch, conspiracy junky extraordinaire. This tension is a staple of our pop culture. From The Crying of Lot 49 to The Parallax View to Twin Peaks, it’s the gift that keeps on giving. The questions never get answered: when is it better not to know? If you’re paranoid, how can you know when they’re actually after you? How do you know when you’ve reached the conspiracy’s end? The attitudes change over time: in the ’60s, cynicism bolstered belief in conspiracy. In the ’90s, the cynics were the ones who didn’t believe (re: Gillian Anderson in The X Files). One of the most persistent figures on mainstream television is Detective John Munch (played by Richard Belzer). Munch’s antiquated obsession with ’60s-style conspiracy is his defining quality. It’s also the quality audiences find most endearing in him. 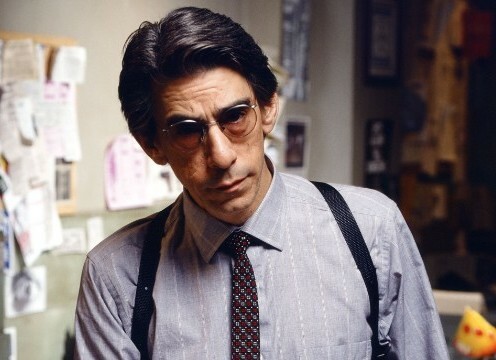 Munch, who first appeared on the television series Homicide and just recently retired from Law & Order: SVU, has made guest appearances on eight other shows: more than any other actor-character in television history. Munch isn’t an icon, but he has more connections than anyone else in the vast Tommy Westphall Universe. If anything, he seems to be part of a conspiracy – the man who keeps showing up. His presence and popularity demonstrate the endurance of the paranoia, the obsession, and the conspiracy as aspects of our cultural identity. From his first appearance, Munch was a throwback to a specific type of conspiracy nut, earlier ideas about conspiracies and how they work. Large institutions still conspire and commit crimes; but they are also increasingly unwieldy, chaotic, and prone to leaking. In the ’60s, political paranoids imagined puppet masters operating behind the curtains. Today, we imagine the offices of the NSA: wide open and filled with hundreds of employees committing crime after crime after crime, sometimes unwittingly, and often not very well. Fifty years after the fact, the assassination is a touchstone of the paranoid style in American life, a symbol of the American affection for conspiracy. In 2013, the Kennedy assassination registers only on certain frequencies, none of them political. It’s not a tragedy anymore; it’s an essential part of our pop culture, like Superman or alien invaders. I mean, seriously: look at this. So today, I don’t feel nostalgia for John F. Kennedy. I feel nostalgia for John Munch.